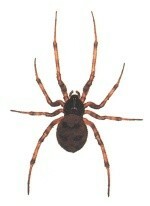 Many species of spiders are common household pests in the United States. Certain common household spiders spin webs overs lamps, in corners and in basements. This creates an unsightly mess but causes no real harm. Remember that every “cobweb” was made by a spider. Although all spiders use venom when they bite and kill their prey, the black widow and the brown recluse spiders are the only spiders in North America dangerous to humans. Even though their is little danger of complications from spider bites, be advised that all spider bite victims should take the spider with them when consulting their physician. The black widow spider is a spider notorious for its neurotoxic venom. It is a large widow spider found throughout the world. 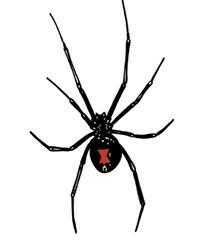 Adult female black widow spiders are shiny black with an hourglass shaped marking on the bottom of its abdomen which, although most commonly red, may range in color from white to yellow to various shades of orange and red. A large female black widow spider can grow to 1.5 inches (38 mm), counting legspan. The body is about 0.5 inches (13 mm). The chief danger from black widow spiders lies in their venom. Widow spider venom is one of the few medically significant venoms possessed by a spider in North America. Widow spiders, although not aggressive, do occasionally bite humans. Bites occur most often when someone accidentally presses the spider into his or her flesh by handling something on which the spider has attached its web. This is where the widow spider’s habit of nesting in woodpiles or in between boxes and crates in garages and warehouses becomes significant. In general, widow spiders are a very timid group of spiders that will only bite when threatened. The bite from the widow spider causes a set of symptoms in the bite victim known collectively as latrodectism. Latrodectism is caused by the neurotoxic venom injected by the widow. The initial bite is often painless and goes unnoticed; at worst it will feel like a pinprick. The toxin then travels through the nervous system. The first significant symptom is a dull, numbing ache in the region of the actual bite. This ache may progress to painful muscle cramps in the large muscle masses of the body, particularly the abdomen. Additional symptoms may include sweating, nausea, a rise in blood pressure, leg cramps, muscle tremors, loss of muscle tone, heartbeat irregularities, and vomiting. Symptoms and pain begin between 15 and 60 minutes after the bite and generally peak within one to three hours. Symptoms are usually completely dissipated within 12 to 24 hours. In extremely rare cases (< 1%), death may occur. Very young children and elderly adults are the most susceptible to the widow venom and, therefore, the most likely to experience severe symptoms. If you suspect that you or one of your children have been bitten by a widow spider, seek medical attention immediately and, if possible, bring the spider with you to the medical center for positive identification. 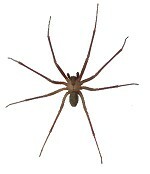 The brown recluse spider is a venomous spider. It is usually between 1/4 and 3/4 inch but may grow larger. It is brown and usually has markings on the dorsal side of its thorax, with a black line coming from it that looks like a violin with the neck of the violin pointing to the rear of the spider resulting in the nickname “fiddleback spider”. Coloring varies from light tan to brown and the violin marking may not be visible. Recluse spiders build irregular webs that frequently include a shelter consisting of disorderly threads. People get bitten when they unintentionally squeeze them in clothing and bedding. The severity of the bite may vary. The symptoms may vary from no harm at all to a reaction that is very severe. Often there is a systemic reaction within 24-36 hours characterized by restlessness, fever, chills, nausea, weakness, and joint pain. Where the bite occurs there is often tissue death and skin is sloughed off. In some severe cases, a wound may develop that lasts several months. In all cases, a physician should be notified. If at all possible, kill and take the spider to the physician for positive identification. The Common house spider, sometimes called the American house spider, is an extremely common spider. There are several species sharing many common features. They build their tangled web in secluded locations, which can also house eggs contained in one or more spherical sacs.